When it comes to fashion blogging, it's hard not to compare. I don't know why we do it, but comparing ourselves to other bloggers: who's thinner, prettier, has more designer handbags, the list goes on, and we compare quite often. But the truth is, even though competition is fierce out there, life is not a race. Success comes in different ways, and while our heroes might experience success differently that what's possible for us, it doesn't mean we can't find our own ways. 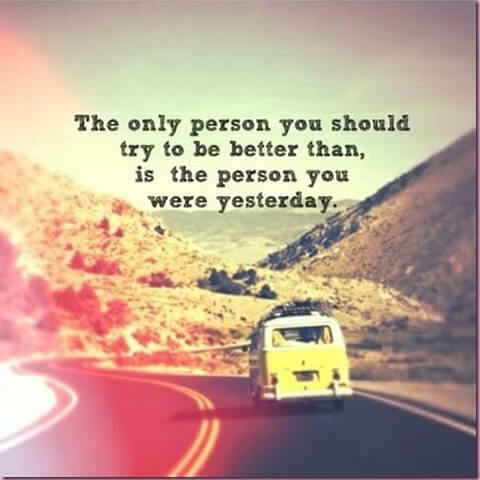 Which is why, really, the only person we need to be better than, is who we were yesterday. It's a daily, even moment to moment process that over time will land us each on the path we're meant to be on. I’ve found that when I start comparing like that, it helps me to go back to the first posts I wrote and see how far I’ve come. While I only started a month ago, I’ve already seen a huge improvement. I’m sure it would be even more effective for those who have been blogging a lot longer than that. That reminds me of what Mikhail Baryshnikov said: I do not try to dance better than anyone else. I only try to dance better than myself. I couldn’t have said it better myself. I recently heard a quote that really resonated with me, “Never compare your insides to somebody elses outsides.” We so often compare ourselves to other people based on what we see externally, which is never an accurate or fair comparison. Ever. I couldn’t have said it any better! When we start comparing ourselves, we tend loose sight of who we are and before you know it our content is affected. It starts to loose its spice (YOU) – because you are too busy trying to be like someone else. As small blog, I always try to remember that in every business everyone has their own target audience, so all I have to do is keeping working on me so I can corner my share not someone else’s share of the market.